At the Battle of Badr, the Muslims were outnumbered, 313 ill-equipped men to 900 Makkan soldiers. However, the Muslims were victorious on the 17th of Ramadhan, and this was a major victory by the Muslims in their first battle against the Makkans in their first battle. In the Holy Quran (3:123-124), Allah (SWT) tells us that He sent down 3,000 angels to assist the Muslims in the Battle of Badr. Thus, the faithful were able to overcome insurmountable odds to lead them to this victory. This teaches us that no matter how daunting the odds may seem, if we are with Allah (SWT) and Allah (SWT) is with us, we can overcome anything. To illustrate this, I decided to build a scale. 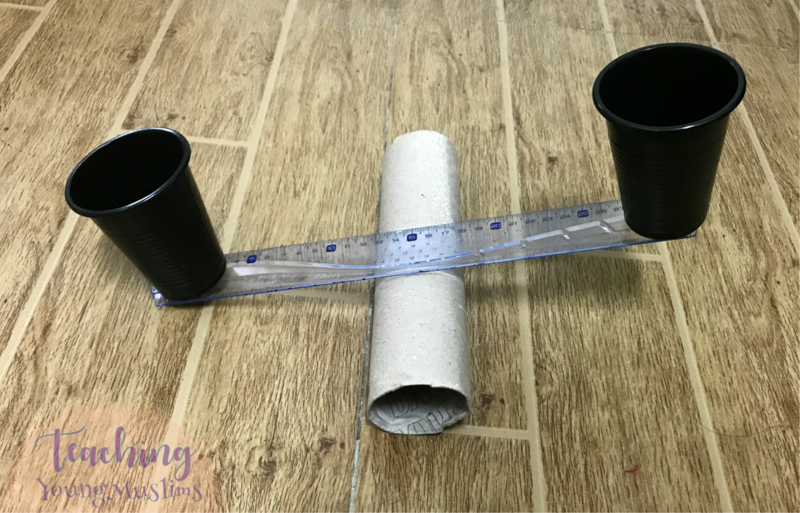 I taped together an empty paper tower roll, a ruler, and two plastic cups, as pictured. To start, put something light in one cup to represent the small Muslim army. Then, on the other side, put to represent the large Makkan army. Obviously, the scale will tip to the side of the Makkan army. However, the Muslims had something that the Makkans did not have – their faith and prayers. To represent the power of that, use something super-heavy, and as soon as we added that vital ingredient, the scales tipped to favor the Muslim army. If you can’t think of what to add, here are some ideas: rocks, magnets, toy cars, any little toys, dry rice (or any other similar dry food). To apply this in our lives, we can have a discussion about having faith in Allah (SWT), believing in Allah (SWT), and trusting Him. This also illustrates the power of praying to Allah (SWT). If we are facing something that feels like it is too much for us, we should not panic – pray to Allah (SWT), and with Him, we can overcome anything! If you enjoyed this post and want to make sure you don’t miss out on any future posts, subscribe to receive all posts by email on the side! You can also like my page on Facebook and Instagram. All the links are on the side!